A fully updated new edition of the bible of model rocketry and the official handbook of the National Association of Rocketry G. Harry Stine was one of the founders of model rocketry and one of its most accomplished and respected figures. His Handbook of Model Rocketry has long been recognized as the most authoritative and reliable resource in the field. 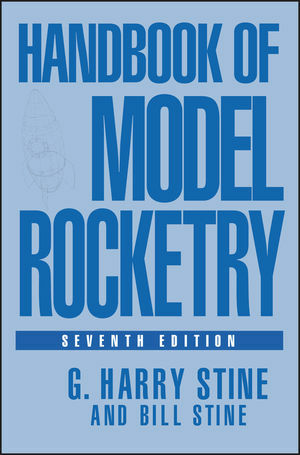 Now fully updated and expanded by Harry's son Bill Stine, who inherited his father's passion for model rockets, the new Seventh Edition includes the many changes in the hobby that have occurred since the last edition was published, such as new types of rockets, motors, and electronic payloads, plus computer software and Internet resources. This new edition also includes new photos and a new chapter on high-power rocketry. G. Harry Stine, founder and one-time president of the National Association of Rocketry, started the world's first model rocket company, whose kits are now in the Smithsonian. Bill Stine, also a model rocket expert, is the founder and president of Quest Aerospace Inc.
G. HARRY STINE was the founder and one-time president of the National Association of Rocketry. An engineer, science writer, and author, Stine also started the first model rocket company, whose kits are now in the Smithsonian. His son, BILL STINE, is a model rocket expert in his own right and is the founder and President of Quest Aerospace Inc. Preface to the Seventh Edition. 1. This Is Model Rocketry. 3. Tools and Techniques in the Workshop. 6. Ignition and Ignition Systems. 7. Launchers and Launching Techniques. 8. How High Will It Go? 14. Building and Flying Large Models. 20. Where Do I Go from Here? Appendix II: Model Rocket CP Calculation. Appendix III: Rocket Altitude Simulation: Computer Program RASP-93. Appendix IV: Static Stability Calculation: Computer Program STABCAL-2. Appendix V: The Triple-T rack Tracker. Appendix VI: Two-Station Alt-Azimuth Tracking Data Reduction Program MRDR-2. Appendix VII: Three-Station Elevation-Angle-Only Tracking Data Reduction Tables. Appendix VIII: Sample NAR Section Bylaws.